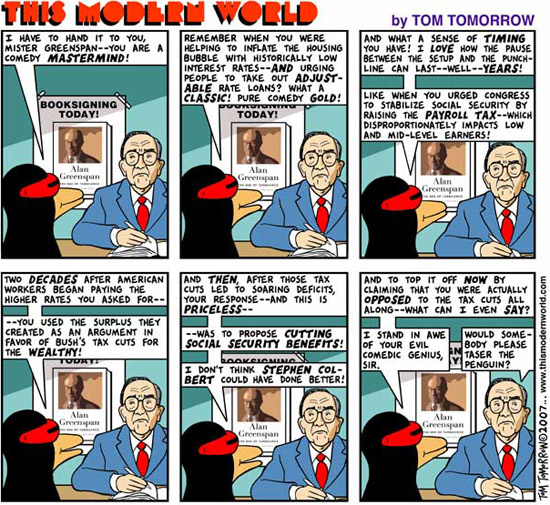 Penguin: “I have to hand it to you Mr. Greenspan — you are a comedy mastermind! Penguin: “Remember when you were helping to inflate the housing bubble with historically low interest rates — and urging people to take out adjustable rate loans? What a classic! Pure comedy gold! Another priceless example of the left’s inability to tell the truth. SOCIALISM IS BUILT ON LIES. Greenspan advocated SOCIAL SECURITY TAX INCREASES two decades ago. Not income tax increases. Let me ask a question. Does the truth mean anything to you liberals? Obviously not, if a lie can be used to further your means. yo, the author of the comic didn’t say Greenie backed income tax increases but payroll tax increases. I’m not sure what you mean by “you liberals” [looks around]. Shrug.